Grab the whole family and take a trip to a Virginia pumpkin patch this Fall! There's a lot to love about virginia in the fall - and pumpkin picking? That's one of our favorite Autumnal pastimes. From the hayrides to apple cider, bonfires to face painting; a day at the local pumpkin patch is a memory to cherish forever. we've curated this list of family farms around the state that offer all the pumpkin-filled fun you can handle. so get exploring! Blue Ridge Pumpkins - A family-owned and operated, pick-your-own from the vine, classic pumpkin patch with over 28 varieties of pumpkins and gourds. Open for business September 1st through October 31st. Other activities include hay rides, and barrel train. White Hall Farm - Hay bale mazes, unlimited hay rides, bonfires, picnic areas, farm animals, pumpkin painting, PYO pumpkins, and the hay bale castle. Open October 6-Oct 31 in Gretna, VA.
Kim’s Crazy Corn Maze – Hay rides, pumpkin picking and overall family fun in Castlewood, VA. Open Sept. 14 – October 31. Punkin’ Patch – Punkin’ Patch is a locally-owned farm in Nickelsville, VA. Walter Main and his family have been hosting fall celebrations at the family farm for 25 plus years. Punkin’ Patch features a Farm Petting Zoo, Hayrides, Corn Maze, and Saturday night jams. Open September through October, the farm features a Harvest Celebration the last weekend in September, which includes a pumpkin weigh-in, flat footin’ contest, and much more family fun. The Crab Orchard Corn Maze & Pisgah Pumpkin Patch – Already-picked pumpkins, wagon rides, and a corn maze. Fisher & Co BBQ on site, flashlight tours after dark on Friday & Saturday. Open September 15 – November 4 in Tazewell, VA.
Lloyd Family Farms – Rockville, VA. Family-owned farm with corn maze, pony rides, farm animals, hay rides, food trucks, PYO pumpkins, Fall mums. Opens September 28th, open Fridays, Saturdays, and Sundays. Gallmeyer Farms – Richmond, VA. A low-key “on the farm” family experience. Hayrides, spooky house tours, the straw bale maze, and the romping pile, PYO pumpkins. Other popular fall offerings include: pie pumpkins, winter squash, Indian corn, straw bales, corn shocks and gourds of many shapes, sizes and colors. Opens on the last Saturday of September and close on the evening October 31. Belmont Pumpkin Farm – North, VA. Family owned since 1983. Pick-your-own pumpkins, corn and sunflower mazes, farm animals, ‘famous pulled pork BBQ and pumpkin desserts.’ Pumpkin funnel cakes, pumpkin rolls, BBQ, the mazes, treasure hunts, hayrides and more. Open September 29th. Hickory Ridge Farm – Chesapeake, VA. U-Pick pumpkins, hay bails and corn stalks for fall decorating. An 18 acre working family-owned farm that grows their own pumpkins. They also sell fresh produce, products, jam and honey. Pumpkin patch open Sep. 15-Oct 30th. Corn Maze in the Plains – The Plains, VA. 5 acre corn maze, night maze, private campfires, pumpkin picking – Oct. 5 – November 4th. 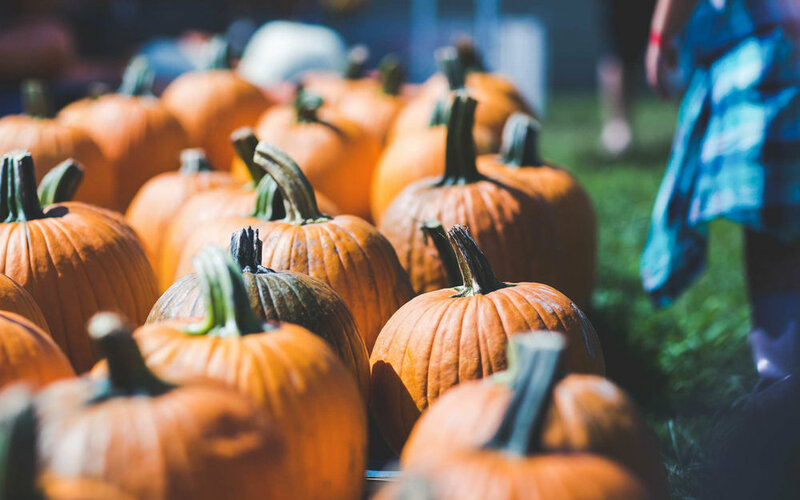 Yankey Farms – Nokesville, VA. Search through thousands of pumpkins in a wide variety of colors and shapes and pick them right where they grow. On Fridays, Saturdays, and Sundays from September 29 through October 30, you can pick the perfect pumpkin, get lost in the corn maze scavenger hunt and ride around the farm on the cow train. Farmyard activities include corn boxes, hay piles, slides, and a pedal tractor track. Wayside Fun Farm – Berryville, VA. Wayside Farm Fun has pig races, corn mazes, pumpkin patches, farm animals (even a goat walk) and pumpkin smashing. Open September 30-Nov 4. Round Hill Farm – Culpeper, VA. Tractor hayrides, pick-your-own pumpkins, petting zoo, hay bale mazes, pony rides, picnics, face painting and more. October 6-October 31. Hill High Farm Pumpkin Patch – Winchester, VA. Corn mazes, daytime & moonlit hay rides, haunted house, petting zoo, straw maze. September 22th-October 31st. Marker Miller Orchard – Winchester, VA. Saturday, October 27th is their Pumpkin Festival. Come find the "great pumpkin." Choose from ones already picked or pick your own. Enjoy pumpkin pie, pumpkin rolls, pumpkin bars and pumpkin donuts from our bakery.